It also has an ON/OFF switch so you can turn off the RED LED feature when its not needed. 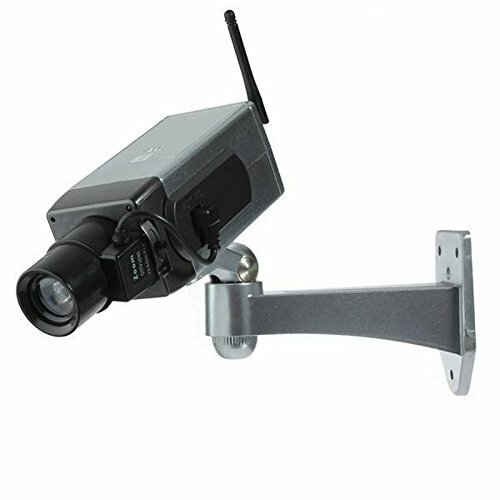 This camera is most commonly mounted pointing at cash registers, entrances, problem shoplifting areas, or at gas pumps. This is a Rotation Surveillance Gun Style Dummy Camera. Now you can deter robbery, theft, and vandalism without the high cost of a real security camera. Cheap and effective way to deter criminals. Can be used both indoors and outdoors. Protect your homes, shops and business. When place it indoor or outdoor, even the most sophisticated criminals will think the place is guarded by a high-tech surveillance system. The camera contains a fully adjustable mounting bracket and stainless steel screws that will let you install the camera quickly and easily. No wiring is required for setup. Appears to work as an actual security camera. This simulation camera has built-in light sensor function. Realistic appearance, looks like the real monitor and camera. The red LED light will blink, and it will automatically rotate 12 seconds. Features an authentic video cable and a fully adjustable mounting bracket. Installs quickly and easily to the ceiling or wall using the included screws.